MANILA, Philippines - The April 2018 NAPOLCOM exam result and list of passers for Police Officer promotional exams are available at this website as the National Police Commission officially released the results online approximately three (3) months after the date of examination. Results of promotional examinations for other positions as well as top 20 examinees are also posted. Below is the complete list of passers for April 2018 Police Officer promotional exams, courtesy of NAPOLCOM. 18-04-1605294, APOSTOL, MARIE HANNAH ..
18-04-0105210, LORENZANA, KELLY ANN . 18-04-0105375, PICO, MARK ANTHONY . 18-04-0505167, SALVADORA, MARK KEVEN . 18-04-0305167, SIGUA, ERICK JOHN . 18-04-1605143, TOLEDO, EVAN JEFFREY . 18-04-0505025, TOLEDO, MARJON FRANCIS . 18-04-1105384, ZAFRA, JOSE NOVEM . The entrance and promotional examinations are administered by NAPOLCOM on April 22, 2018 at designated regional testing centers around the country. As quoted from Atty. Rogelio T. Casurao, the Vice Chairman and Executive Officer of NAPOLCOM, these exams aim to promote and recruit more law enforcers in order to enhance police visibility around the country as well as strengthen the insurgency operation of PNP. While takers are now asking about the possible release date of the official results for PNP entrance and promotional tests, PRCBoard.com wrote in a related article that this will be release in two to three months after the exams. This page will be continuously updated soon as the administrator sees important related announcements regarding the aforementioned exams. We advise our readers to visit NAPOLCOM official website, bookmark this page and follow us at our social media accounts via Facebook and Twitter to receive fast and timely updates regarding the April 2018 NAPOLCOM exam results. 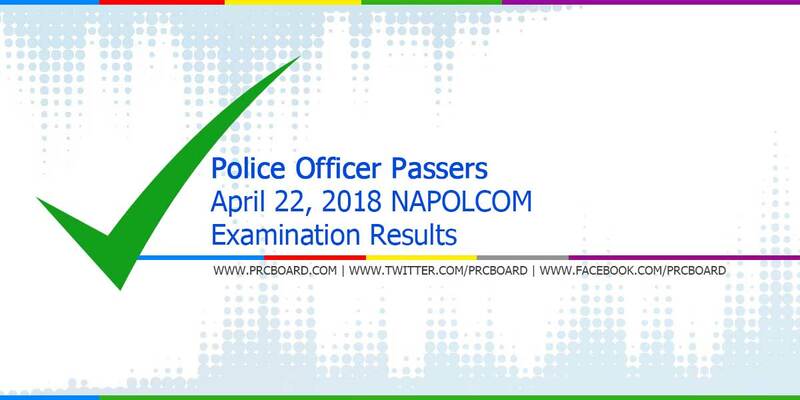 kelan po ang posting ne result sa April 22, 2018 Napolcom Exam? Kailan po ang release date ng result for the april 2018 napolcom exam..tnx po. Good pm kilan po release ng result ng napolcom exam? Thanks..
May result na po ba? kilan po ang result ng exam? July 23 po ba ilalabas rezult? Last week of july yata ang result pa bago ang online ulit..